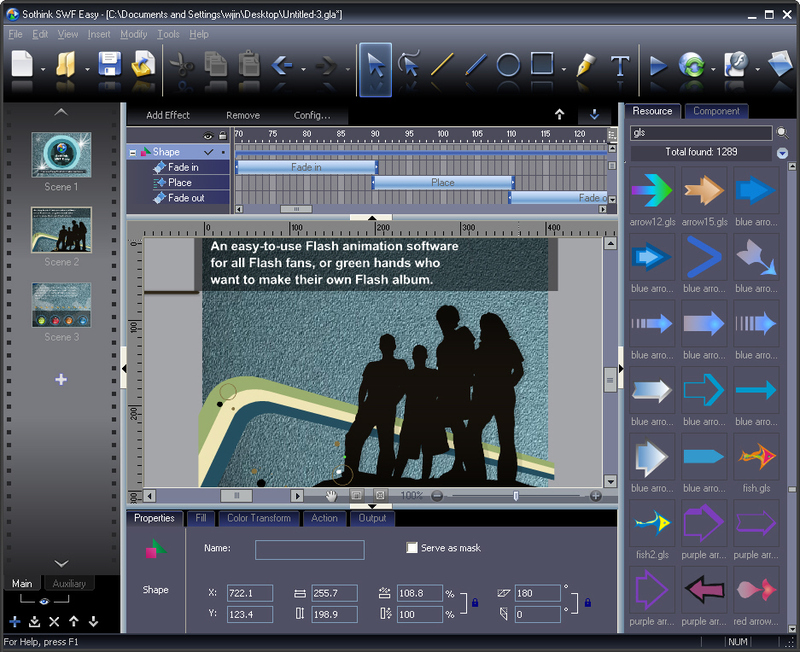 As a quick and easy-to-use Flash authoring tool, Sothink SWF Easy provides Flash fans with a great variety of resources, effects, templates and flexible Action Script. The built-in Flash Album, Banner, Navigation Buttons templates and animated effects will help you to create professional Flash arts easily and quickly. Also, it supports importing external resources, like shapes, images, buttons, sounds, movie clips and video. ...... Dozens of animation effects are built in and can be applied to any elements. You can edit those effects to your own taste and create more unique stack effects basing on those built-in ones. Applying external resources is supported and you can import shapes, images, buttons, sounds, movie clips and video. Various tools help you draw and edit vector arts and create rich format text in the way of What You See Is What You Get. You can set one or more images as the background of a foreground scene. If you want to set some image to be the background of many foreground scenes conveniently and quickly, Background Scene function can help you. Action can be added to both elements and scenes. And Action Script 2.0 is supported for you to create more advanced and excellent movies. * Easily create Flash Albums, Flash Buttons, Flash Banners, etc with pre-made templates. * Easily make a professional Flash Presentation. Qweas is providing links to Easy Flash Maker 6.2 as a courtesy, and makes no representations regarding Easy Flash Maker or any other applications or any information related thereto. Any questions, complaints or claims regarding this application Easy Flash Maker 6.2 must be directed to the appropriate software vendor. You may click the publisher link of Easy Flash Maker on the top of this page to get more details about the vendor.